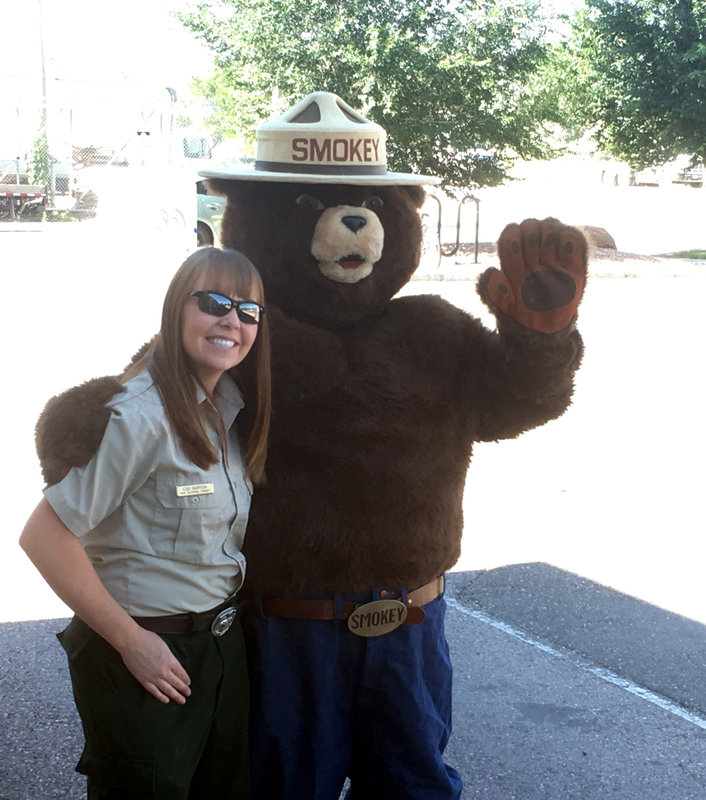 CEDAR CITY — As part of the USDA “Feds Feed Families” summer campaign, federal employees from the Dixie National Forest gathered and delivered – with the help of Smokey Bear – 463 pounds of food Tuesday to the Iron County Care and Share. According to the Feds Feed Families website, the campaign was created to help keep food pantries stocked for the months of June through August, when traditional donations are typically lower but need is higher. Employees are asked to bring in nonperishable food items and place them in a container at their workplace. Tuesday’s delivery comes a couple weeks after a more informal, spur-of-the-moment donation that took place around the culmination of the Brian Head Fire, said Peggy Green, executive director for the Iron County Care and Share. The donations – primarily perishables such as eggs and milk – came from the Brian Head and Parowan fire departments’ fire camps and were gathered by the Forest Service. “They contacted me and said, ‘Hey, we’ve got some extras,’ and made a great donation then,” Green said. The food pantry saw an increase in people with emergency food needs during the fire, Green said. Last year, the Iron County Care and Share food pantry received almost 900,000 pounds of food and directly distributed over 750,000 pounds to people in need, approximately 800 families per month, Green said, adding that any unused donations stay local. “When we ever have excess of something, we go to our fellow nonprofits first,” she said. Green said that if she knows they’re not going to “turn something” quick enough, she approaches places like the Canyon Creek Women’s Crisis Center, the Family Support Center and the Bread of Life soup kitchen. “Nothing goes to waste around here,” she said. Sue Baughmann, minerals administrator with the Forest Service, said they were pleased with Tuesday’s donation but hope to be able to do more in the future, both in Cedar City and other communities connected with Dixie National Forest, which spans from St. George to Escalante. Baughman said that while she was pleased to have been able to coordinate with fire crews to gather the “leftover” donations that would have otherwise gone to waste, the Brian Head Fire and other fires in June and July also unfortunately meant not as many people were around to donate personally. I love to see people coming together to think outside of the traditional “Holiday Season” for food pantry donations. I think it’s important that if we can, we should help out. It’s just the right thing to do. Make your Mom proud, donate food to local food banks!